Create with Traci: Thank you! With your support I've earned my FIRST Incentive Trip with Close To My Heart!!! 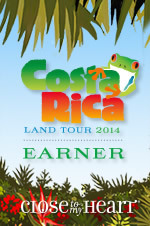 Next March CTMH is sending my hubby and I to Costa RIca! I am beyond thrilled and want to thank everyone for your support. Whether you visit my blog, place orders, are on my team or attend my events- I APPRECIATE you so much. Thank you, from the bottom of my heart... this means so much to me!